I’ve been getting a lot of questions about mixing Plaster of Paris into paint for no-prep painting. Thought it would be a good idea to do a post on the FAQs! Why do you always choose to paint with Plaster of Paris mixed into your paint? When you add just a little Plaster of Paris into paint, it somehow transforms it into this stick-to-everything stuff! It’s crazy. It’ll stick to shiny surfaces, particle board – anything, without having to sand and prime. Anything that will save me a few minutes is ok in my book! Then just applying some Minwax for the last step, to protect it. 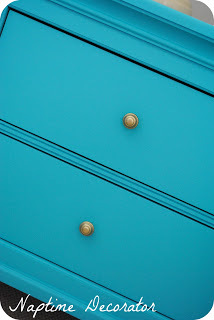 I have used this homemade recipe on pretty much every piece of furniture I’ve painted in the last year and it’s ahhh-mazing. I love that I can pretty much paint anything with it, and not have to sand and prime. Saves a ton of time! How exactly do you mix it? First, I grab an old tupperware, or plastic container. Those giant yogurt containers are great, or the plastic tubs of lunchmeat…you get the picture. Then, I pour some paint in it, about 2/3 full. Then, I take a couple small spoonfuls of plaster of paris, and using a wooden paint stick (or whisk), stir it really well. It will be just slightly thicker than paint. Grab a paintbrush (I use whatever I have laying around – usually 2 or 3 inch brush) and you’re ready! How do I know if I’ve added enough plaster? This has happened to me before, in fact, just last weekend! If you start painting and the paint just sort of breaks away, or beads off and doesn’t “stick” – you know you need a little more plaster. Add another little spoonful, mix it up well, and try again. What happens if it gets super thick and pasty? You can try to add warm water to it, but sometimes it’s just too far gone and it’s easiest to just scrap that batch and start fresh. I’ve noticed these little white clumps/dots when painting. What’s up with that? This has happened to me before after I’ve been painting something for a while, usually at the end of my project, if it’s a time consuming one. Not sure exactly why it occurs, but maybe the plaster’s just settling on the brush a bit or at the bottom of the mixture? If I still have a good bit to do, I start a new batch, and wash my brush. Will the paint adhere to glossy surfaces? I have painted a LOT of surfaces, and it’s worked on everything so far. My advice is to mix up a tiny bit, and try it on a very inconspicuous spot. If it adheres, you’re good! Where can I buy Plaster of Paris? I buy mine at Michaels, but most hobby stores and home improvement stores sell it. I use Minwax, in the natural finish. Again, I use it because it’s sold at my local home improvement store, and not expensive. Will the natural finish leave a color on my white painted furniture? I was concerned about this, but it does not. Just make sure to wipe it off soon after you apply it. How exactly do I use the wax? I take two cloths – I dip one cloth in the wax, get some wax on it, and wipe the furniture all over. Kinda like I’m dusting it, but with some elbow grease. I usually wipe it right off with the clean cloth a couple minutes later. If you wait too long, it hardens. That’s all there is to it. The only place I’ve had chip is a spot in our dining room chairs where my kids slam the chair in when they leave the table;). But it’s just a tiny black dot – nothing major. Can you distress the surface? Yes! It’s SO easy. Just take a piece of sandpaper and rub it on the edges, and wherever you want it to look aged. It chips right off. My painted table feels very…flat and chalky. Will the wax make it feel softer? Absolutely. Once the wax is on, it will feel smooth and soft to the touch. The flat, chalky feeling will go away. And the wax will leave a slight sheen to it as well. Would you recommend this on a high traffic surface, like a dining room table or kitchen island? I probably would not use this on a dining table surface, just because it’s not as durable as say, a polyurethane coat. But for anything else, I think it’s fab. When you paint your furniture with white, what paint do you use? I always just grab the white flat or satin paint in the quart size. Right off the shelf at my home improvement store. Can I make a custom color with this method? Yes, that’s one of the awesome things about it. You can even mix those little acrylic craft paints into the mix. Just about every shade I’ve done has been one I’ve used several colors to get:). I hope this answers your questions about Painting with Plaster! If I missed anything, let me know and I’ll get back to you as soon as I can! Do you put a sealant on after the wax? I’ve used your plaster of Paris tip a bunch of times, but it always leave brunch lines. How do I get a smooth finish? Thanks in advance! Have you used this technique on outdoor furniture? I have an old metal chair and bench I want to paint but do not want to sandblast. Any suggestions? No, I haven’t. I’d go with spray paint, and a clear protective spray paint coat (or several!) over top. Good luck! !